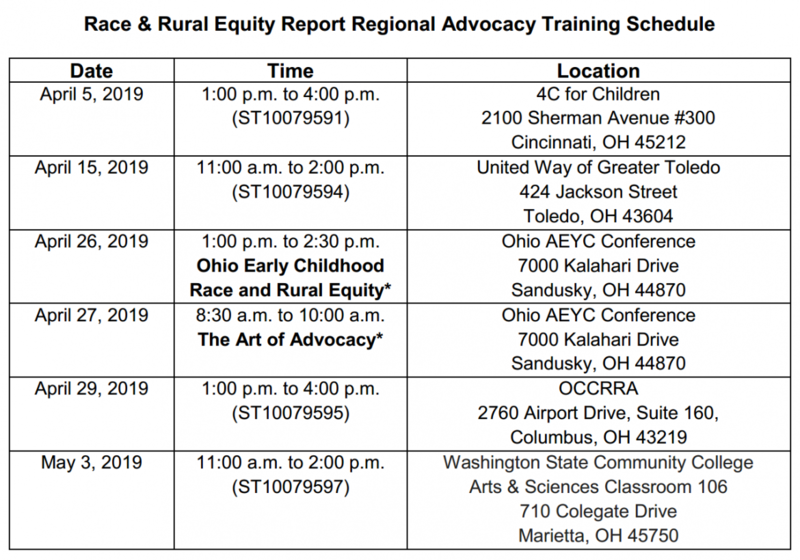 The Equitable Access Coalition is pleased to announce the upcoming Regional Advocacy Training Schedule for Groundwork Ohio's Race & Rural Equity Report. These trainings will build and align an informed and vocal advocacy base to promote increased investment in quality early childhood and school-age programming for all of Ohio’s children. Register for the event closest to you in the Ohio Professional Registry (OPR). The April 26, 2019 (Ohio Early Childhood Race and Rural Equity) and April 27, 2019 (The Art of Advocacy) sessions are part of the Ohio AEYC Conference – attendees must be registered for the conference in order to attend.